Multiagent systems serve as an enabling technique for modern manufacturing and logistics applications; e.g., in “Industry 4.0”. However, these settings require agents to coordinate their actions in a complex environment. This gives rise to the following questions: How can autonomous agents coordinate their distributed activities a) with incomplete knowledge and limited perception of their environment? b) in mixed settings with cooperating as well as competing entities? 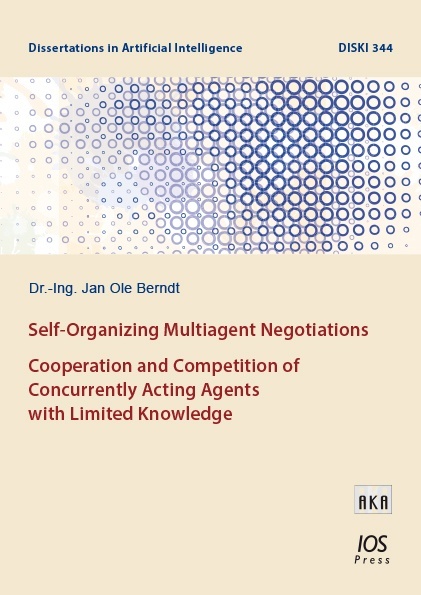 c) in the presence of concurrently acting other agents?To answer these questions, Jan Ole Berndt presents a novel approach to multiagent coordination in Distributed Artificial Intelligence. Inspired by Niklas Luhmann’s theory of social systems, he investigates social order generation in concurrent negotiation processes.This book provides an interdisciplinary foundation of coordination and connects sociological concepts with reinforcement learning techniques. It includes a comprehensive formalization of Self-Organizing Multiagent Negotiations as well as a formal analysis of their algorithmic properties. In addition, the author evaluates that method in a simulation and demonstrates its practical application to a real-world logistics coordination problem.